Cottonwood County is located in southwestern Minnesota, the third county east of the South Dakota line in the second tier of counties north of the Iowa border. Russian Mennonites selected it as a site for settlement upon the recommendation of William Seeger, State Treasurer and Secretary of the Board of Immigration, who urged them to come to Minnesota when they arrived in Elkhart, Indiana, and later at Yankton, South Dakota, in 1873. Thirteen families, including 80 persons, took Seeger's advice and settled in the southeastern part of Cottonwood County in the vicinity of Mountain Lake in October of the same year. This settlement was augmented by the arrival of about 1,700 additional Mennonite immigrants between 1874-1880. 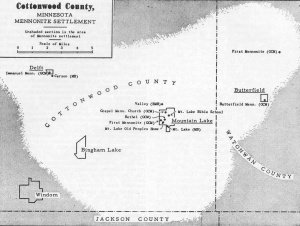 Most of these settled in the Mountain Lake vicinity; others, near Butterfield in adjoining Watonwan County; a later group of Galician Mennonites, also near Butterfield and in the vicinity of Westbrook in the northwestern part of Cottonwood County. After enduring pioneer hardships, the settlement prospered with Mennonites engaging mainly in agriculture while a few set up business establishments. By 1950 the community had two modern hospitals, a large new Home for the Aged, and a Bible School, all operated by Mennonites. Numbering approximately 1,800 in 1954, they worshiped in ten Mennonite churches, eight of which were in Cottonwood and two in Watonwan County: the Evangelical Mennonite Brethren, the Mennonite Brethren, the First Mennonite (General Conference Mennonite Church (GMC)), the Bethel Mennonite (GMC), and the Gospel Mennonite (GMC) churches of Mountain Lake; the Carson Mennonite Brethren and the Immanuel Mennonite (GMC) churches of Delft; the New Home Mennonite (GMC) Church of Westbrook (now disbanded); and the First Mennonite Church (GMC) and the Mennonite Church (GMC) of Butterfield. Waltner, Erland. "Cottonwood County (Minnesota, USA)." Global Anabaptist Mennonite Encyclopedia Online. 1953. Web. 19 Apr 2019. http://gameo.org/index.php?title=Cottonwood_County_(Minnesota,_USA)&oldid=94260. Waltner, Erland. (1953). Cottonwood County (Minnesota, USA). Global Anabaptist Mennonite Encyclopedia Online. Retrieved 19 April 2019, from http://gameo.org/index.php?title=Cottonwood_County_(Minnesota,_USA)&oldid=94260. Adapted by permission of Herald Press, Harrisonburg, Virginia, from Mennonite Encyclopedia, Vol. 1, pp. 721-722. All rights reserved. This page was last modified on 23 August 2013, at 14:29.